Last week the Department for Education (DfE) published their first White Paper in more than five years. Commentators have highlighted how it outlines plans for the most radical reshaping of education governance since the 1902 Education Act. It covers the big themes of how our education system is arranged, funded, governed and supplied with good quality teachers and leaders. However, it is not designed to set out the details of how these reforms will be implemented. This vision stage is an interesting opportunity for those of us that care how these ambitions are implemented. It is an opportunity to prepare evidence and collate our collective experiences to feed into the policy-making cycle via the round of consultations the White Paper will provoke. The Education Select Committee will have the first shot at this. They announced an inquiry into Multi-Academy Trusts (MATs) before the White Paper was even published. They will be looking at the role of MATs in the broader education landscape, their quantity, quality and coverage, the governance of MATs and how their performance should be assessed. All pretty pertinent questions in light of the White Paper’s aspiration to have ‘most schools in dynamic MATs’. Inquiries and consultations are open for anyone to respond to. Fittingly for a democratic process, responses can come from a mix of individuals and organisations and can vary in number. The chart below shows a snapshot of the number of responses to Select Committee inquiries in 2015. Their ongoing inquiry into the purpose of education received the most responses, including NFER’s. 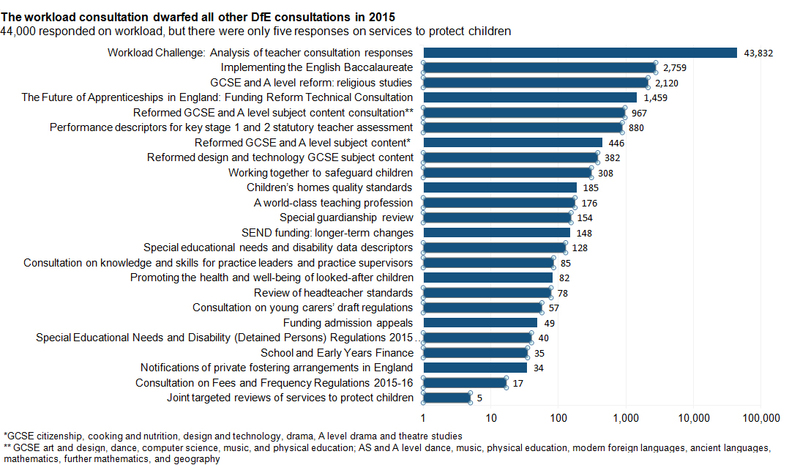 But at 163 written submissions (excluding the web forum), this does not even rank in the top ten of DfE consultations. Can the number of responses be taken as a proxy for the importance of a topic, the strength of feeling that exists in a sector, or the importance that should be attached to individual viewpoints? Examination of responses to DfE consultations in 2015 suggests not. This is illustrated by considering the examples of two topics which most people would agree are extremely important but quite different: the consultation on workload famously received 44,000 responses (the number of responses was so large that only a ten per cent sample was actually analysed) but the DfE review of services to protect children received only five. These seem very pertinent organisations. Despite this, the DfE found ‘the low number of responses suggests that there is no strong opposition to the Government’s proposals to revoke and replace, with some amendments, the existing Joint Area Review Regulations’. I wonder, given the parameters of the consultation, how many responses would have led them to a different conclusion? What is certainly clear is that if organisations with an important stake, or independent evidence, do not respond to consultations, then their voice may not be heard. I am certainly not the first person to ponder the challenges of consultations. Jonathan Breckon, Director of the Alliance for Useful Evidence, explains that the problem with calls for evidence and inquiries is the biased sample of organisations and people that respond. He recommends that the research community needs to be better informed and incentivised to take time to give written evidence – not just the usual suspects. The research community itself also has to take some responsibility, by proactively engaging with consultations and communicating evidence in a way that enables others to include this in their own consultation responses. So, to return to the White Paper, for now this document is a road-map of government priorities. It ought to be possible to influence the details of planning and implementation. So make use of any and all opportunities to put forward any relevant evidence, experience, opinion or opposition, including when inquiries and consultations ask for them. Be a devil in the detail.